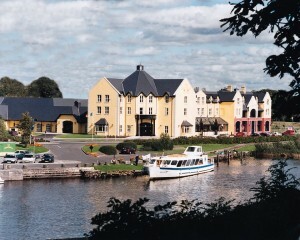 The Landmark Hotel is a 4 Star Failte Ireland and AA-rated hotel found in the heart of the beautiful riverside town of Carrick on Shannon. It is within a 10-minute walk from the Leitrim Design House. This 4-star hotel offers a convenient 24-hour reception, business centre, free WiFi, and a lift to all floors. Guests can also enjoy a range of leisure activities such horse riding and fishing. Carrick on Shannon offers beautiful scenery, a vast selection of activities, wonderful restaurants, great bars and night clubs, and a warm, friendly welcome. No wonder it has become Ireland’s fastest growing inland resort and when it comes to Hens & Stags. So if you are the chosen one and are facing the daunting task of organising a fun and memorable Hen, look no further! The Landmark offers a range of packages with a combination of all that you may require – an afternoon activity, an evening meal, night club, and accommodation! Their reservations team will work closely with you as you plan your itinerary, ensuring that you and the rest of the girls enjoy an unforgetable weekend!